From mid-November until early January, locals and tourists alike enjoy Christmas markets throughout Europe (a charming tradition I wish the United States would embrace). But of all the Christmas markets, the most famous are those in Germany and Austria. No surprise there. While we’ve experienced (and loved) the Christmas markets in German cities such as Berlin, Dresden, and Regensberg, we have to say that Prague’s Old Town Square Christmas market is one of our favorites, if not our most favorite European Christmas market of all time. While it may not be as big, or as grand, as the German Christmas markets, there’s a special something that only a city like Prague can offer. From the gothic style towers of the Church of Our Lady before Týn and the Old Town Hall, and the surrounding Renaissance and Baroque style buildings, Prague’s Old Town Square seems like a medieval dream. And when you add anything Christmas to the combination, this square seems almost too good to be true. But luckily, it’s all for real. 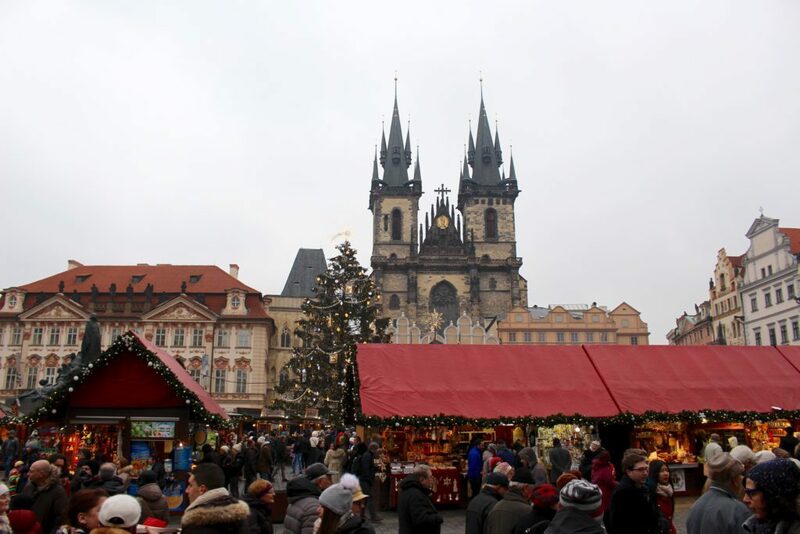 For two years in a row now, we’ve visited Prague’s Old Town Square Christmas market. And hopefully, we’ll continue to come back. From the mulled wine and the juicy Czech sausages, to the overall delicious aromas and jolly feelings emanating from the market, there’s no place we’d rather channel our holiday spirit! 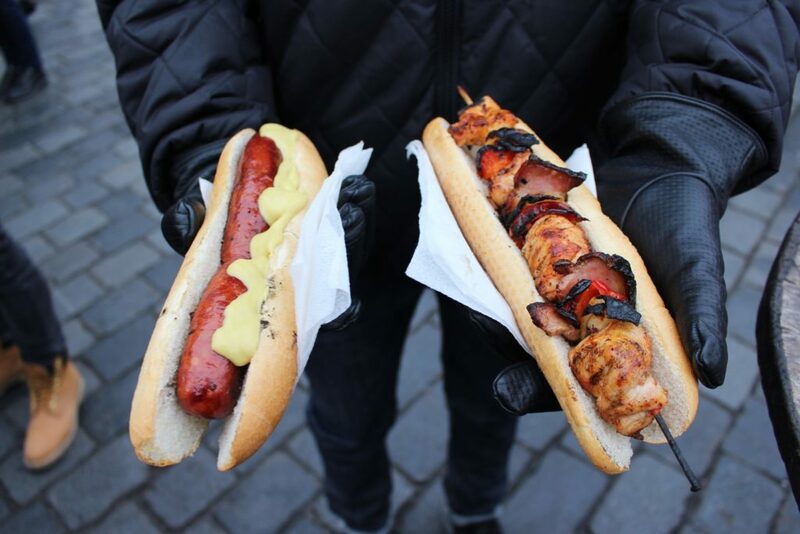 But let’s talk about why we really love Prague’s Christmas market: the food. Anywhere you look within the market, you’ll spot something delicious. Different stands line the market, featuring delights such as fine cheeses and cured meats, sweet pastries, traditional Czech beers, and Prague hams spinning on rotisseries. 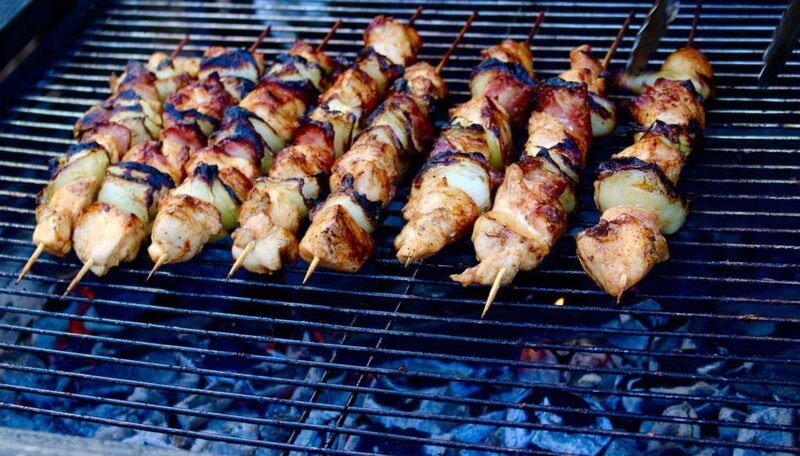 Our favorite treats include the Czech paprika sausages with mustard, and chicken skewers with Prague ham, peppers, and sweet onions. And of course, mulled wine is just the drink to keep anyone warm and jolly while browsing the market. 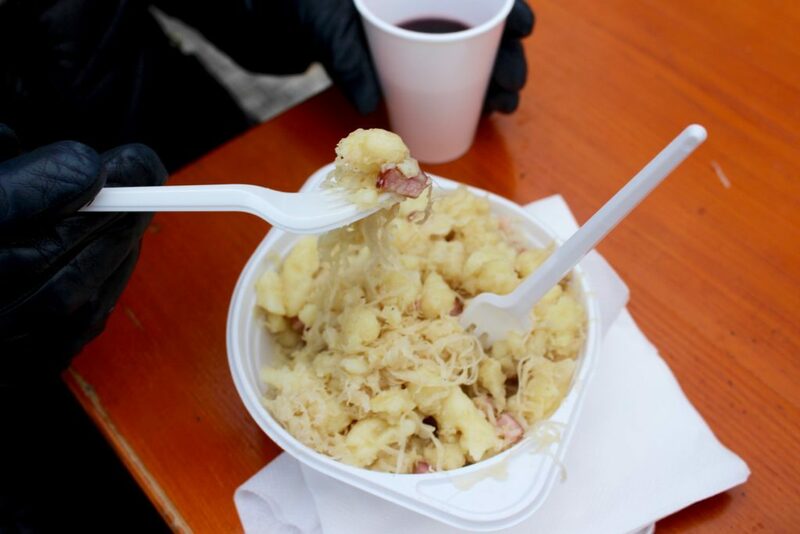 Another must-try is halušky, a Czech dish combining cabbage, potatoes dumplings, and Prague ham. Most likely, you’ve never tried anything like this dish (unless you’ve traveled to the Czech Republic)! We hadn’t either, but we loved it. 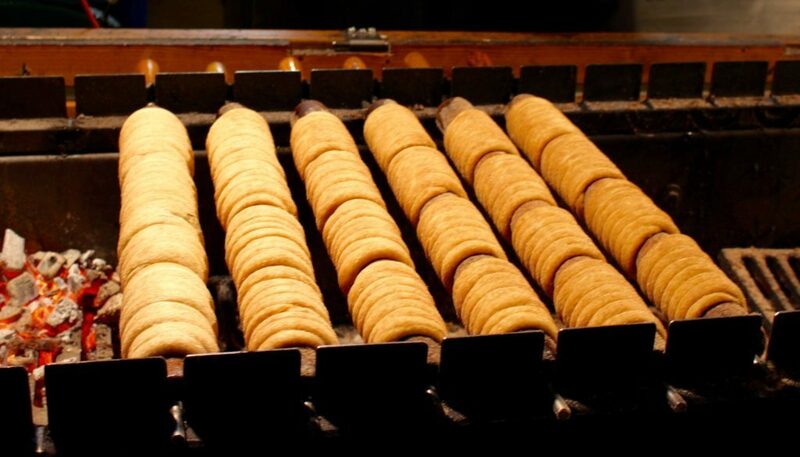 Other favorites include trdelník, dough covered in cinnamon, sugar, and nuts, and served warm, and fresh spiraled potato chips. Prague’s Old Town Square Christmas market also sells typical Czech Christmas trinkets such as tree ornaments, decorations, magnets, hand-carved wooden items, and so much more. Other Christmas treats such as hot cider, chocolates, and gingerbread are also worth trying! 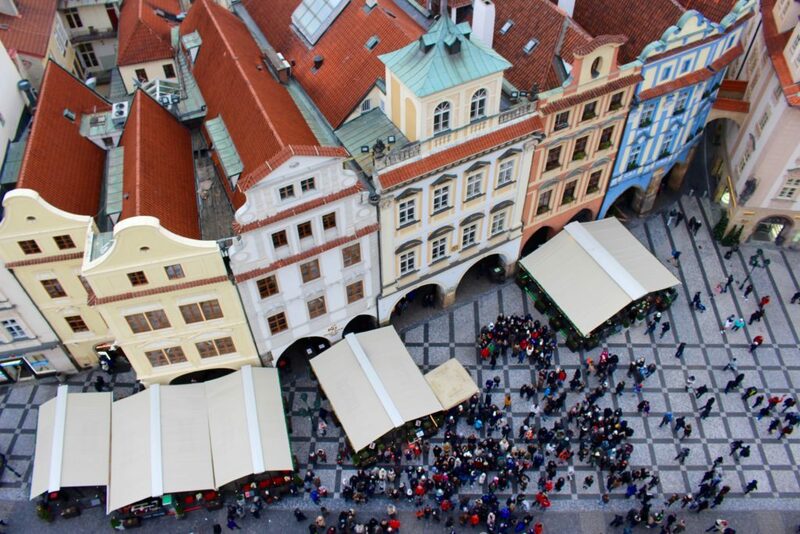 Hearty Czech food, hot alcoholic beverages, stunning architecture, and festive decorations are exactly what you can expect to find at Prague’s Old Town Square Christmas market. It might be less famous than Nuremberg’s Christmas market, and much younger than Dresden’s, but we’d argue it’s more beautiful and delicious anyway. 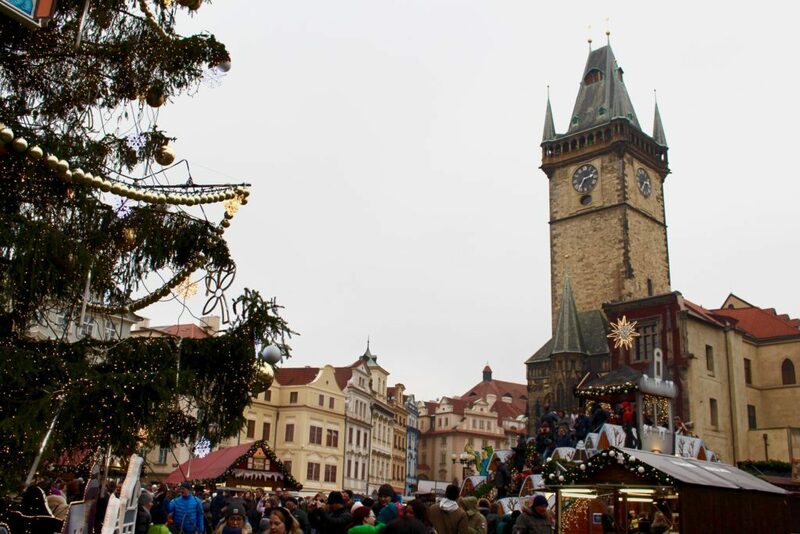 If you haven’t already, add “experience Prague’s Old Town Square Christmas market” to your bucket list! You won’t be disappointed. Over to you! 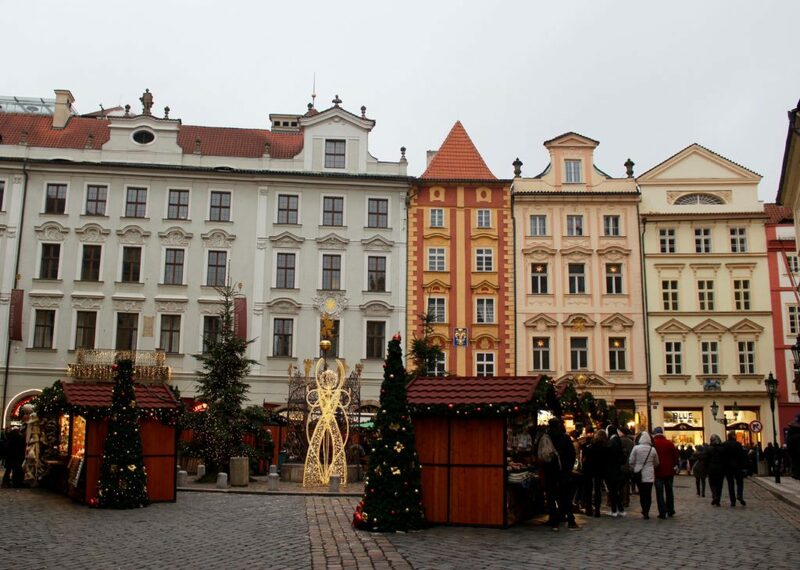 Have you ever visited Prague’s Old Town Square Christmas market? Which European Christmas market is your favorite? Wow! I don’t think I have ever seen a picture of that part of Prague! Love their old town! And that food looks so delicious. YUMM. The food is great! And it makes the entire city smell delicious!! Love Prague especially the historic part – great shots guys! It’s so lovely! We hope to go back in the coming years! Oh my gosh, yum!! The halusky sounds really interesting-I’d definitely try it! What makes Prague ham different from the ham we eat in the US? Just curious :) Gorgeous photos! Prague is definitely on my list of places to visit someday! 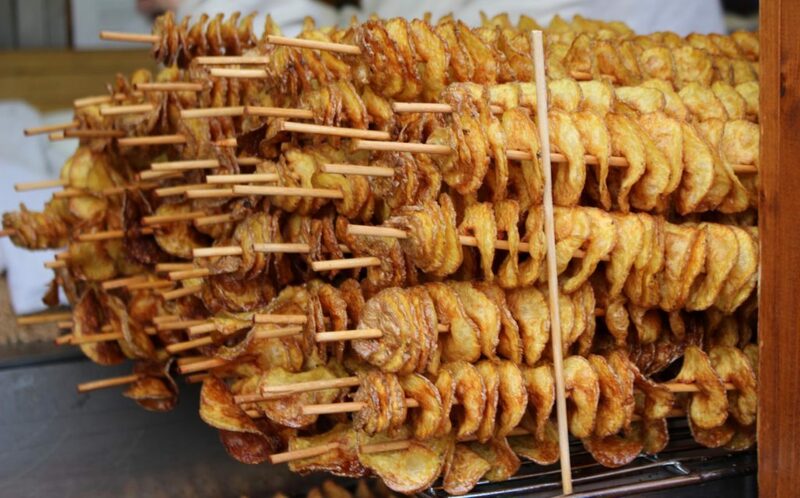 Those spiraled potato chips looks absolutely delicious! I have been them before in Europe but haven’t got a chance to try them. Great photos! 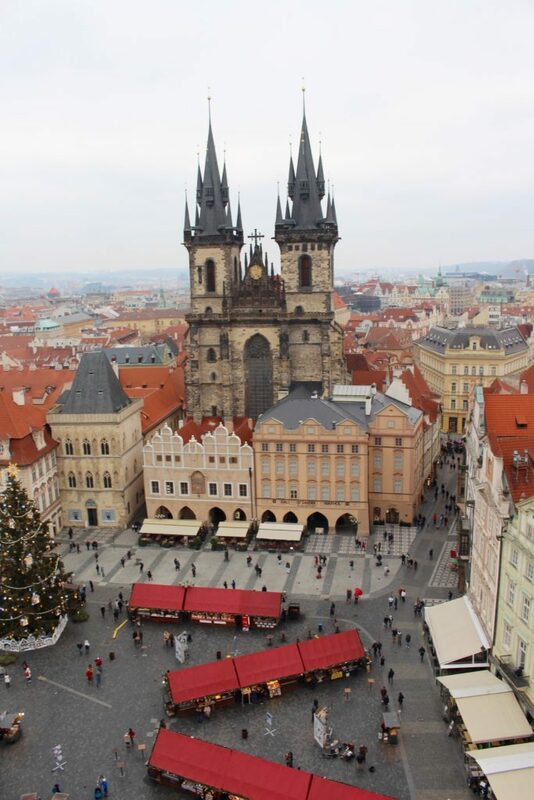 Prague deserves a spot on your list, I’d say! Lovely photos. Our daughter has just started teaching English in a school just out side Prague. It was very warm when we went there a couple of weeks ago but I am looking forward to seeing her winter pictures. I don’t envy her trying to learn the language though.